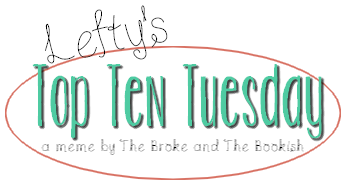 Okay, so I know that I'm the one who came up with this topic for myself this week, but it was still SUPER DUPER DIFFICULT. Because there are SO MANY stunning book covers in this world--it's almost not fair. I even narrowed it down to series, and then I narrowed it down more to series that have more than one cover revealed (because there are lots of series with pretty covers, but only the first cover is out thus far). But still, this was tough tough tough. Why do the cover designers have to be so fracking talented? 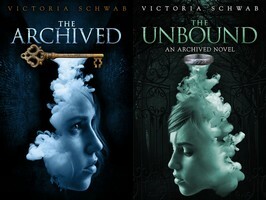 The Archived series by Victoria Schwab - Just LOOK at these. Tell me these wouldn't catch your eyes in a book store. I haven't read these, but I want to, and I want to buy them, just because they are gorgeous. I love the colors and the smoky look they got goin' on. The Caster Chronicles by Kami Garcia and Margaret Stohl - I've always loved these covers (especially in person). They're dark and simple and the font is beautiful! 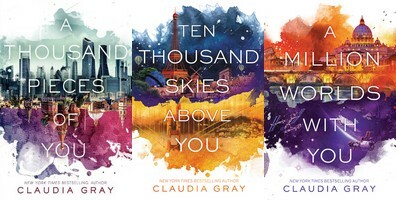 The Firebird series by Claudia Gray - This is another series I haven't read but dem covers are HUBBA HUBBA. I feel like they're really unique, and, of course, I'm basically a toddler, so I love all things colorful. The Lunar Chronicles by Marissa Meyer - I've always loved these covers. The illustrated look of these colors paired with the color scheme and unique font...It's just so appealing. 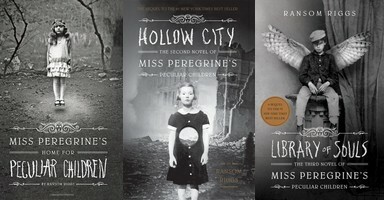 Miss Peregrine's Peculiar Children series by Ransom Riggs - Aggh! These are just so delightfully creepy. 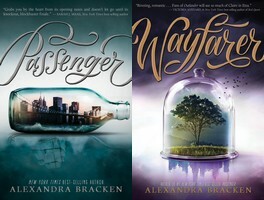 The Passenger series by Alexandra Bracken - These are SO aesthetically pleasing. And they're not entirely unique, but at the same time, they're different than any other covers. I especially love the city in the bottle on Passenger's cover, but I love the purple on Wayfarer's cover. 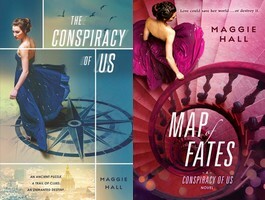 The Conspiracy of Us series by Maggie Hall - Usually I'm not too fond of the Girl In A Pretty Dress covers just because they're so generic, but there's something about these covers that I am drawn to. I have no idea what these books are even about, but I wanna read 'em. And, of course, I loooove the color of Map of Fates. 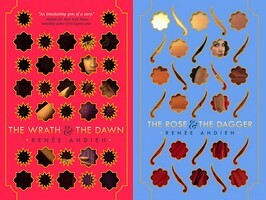 The Wrath & the Dawn duology by Renee Ahdieh - Whenever I see these books on someone's shelves, I just get so jealous. The colors are beautiful, and I think the design is so unique. While I do want to read these books, I'd buy them just so they could sit on my shelves and look pretty. 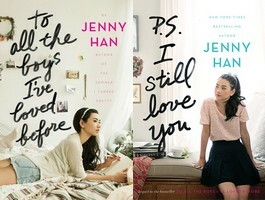 To All the Boys I've Loved Before series by Jenny Han - I don't know what it is about these covers that I've always been obsessed with. Seriously, every time I look at my bookshelf, my eyes always immediately go to these books because I love their covers and their spines a lot. I just love how soft and feminine they are, and THAT FONT!! I can't wait to see what the new book looks like, and I can't wait to add it to my shelf. 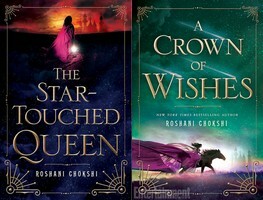 The Star-Touched Queen series by Roshani Chokshi - *drools* The cover for A Crown of Wishes was just revealed last week and I think my heart stopped when I saw it. The colors and images are so pretty in themselves, but I think what really does it for me is the little border. That detail just kind of ties both of these covers together, in my opinion. Talk to me! What do you think of these covers above? What other series do you think have drool-worthy covers? Thank you so much for taking the time to read what I have to say and give your opinion on it. It really means a lot to me. And of course, I will do my best to return the favor. However, as easily distracted and scatter-brained as I am, please don't be offended if I forget to comment on your blog. Share book reviews and ratings with Lefty, and even join a book club on Goodreads. You can visit my very personal, diary-like blog if you want.